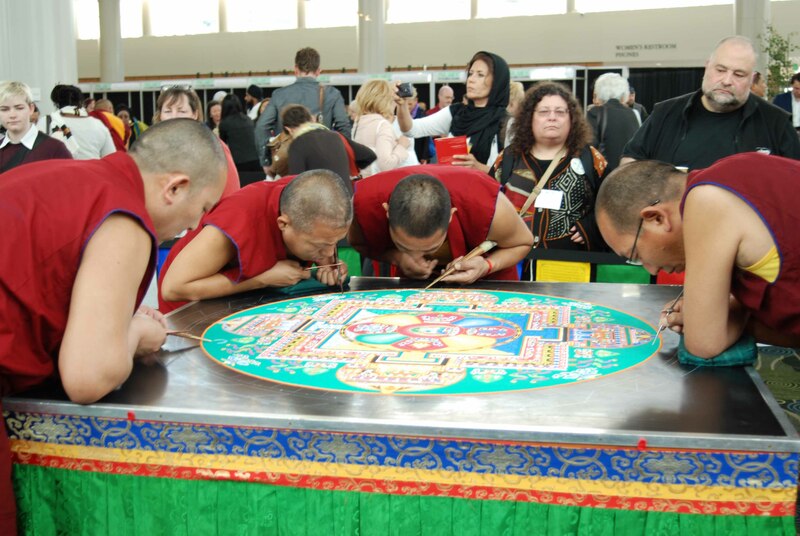 Tibetan monks of the Drepung Loseling Monastery (Atlanta) paint mandala with dyed sand granules inside Salt Palace during Parliament of the World’s Religions. Salt Lake City — Sixty percent of those who registered for the 2015 Parliament of the World’s Religions, are women. Majority of speakers and presenters in the Salt Palace Convention Center for the themed “Reclaiming the Heart of Our Humanity” are also women. Began in Chicago in 1893, the parliament is the world’s largest inter-religious gathering. SHEROES United reflects role models with shared values in families, communities and globally as an “epic force for positive change.” Their enterprising stories reflect women who are “strong, empowered and believe in themselves.” Among 300 SHEROES drumming this morning are Shelly Morehead of Saratoga Springs, Shelley Marshall and Carita Davis of Park City. Ten thousand people from more than 80 countries representing 50 different religious and spiritual traditions have come to Salt Lake City for the five-day parliament, October 15-19. The first parliament in Chicago in1893 drew 3,000 to 7,000. The 100th anniversary parliament in Chicago drew 3,000. Cape Town, South Africa, featuring President Nelson Mandela, drew 7,000. Barcelona in 2004 had 9,000 and the 2009 parliament in Melbourne, featuring His Holiness the Dali Lama, drew 6,500. “Religion has historically been ‘hands off’ on the issue of rights for women,” says The Rev. Dr. Phyllis Curott, a Parliament of World Religions trustee and vice chair. Her remarks to the Inaugural Women’s Assembly appear as an “Ideas” post on the “Time” magazine website. “For thousands of years,” Curott says, “the idea of male superiority has perpetuated violations of women’s essential dignity and safety, an archaic view that many religions and many religious leaders and institutions continue to this day. The consequence for women is not just soul-damaging discrimination; it’s deadly. “Religion has played a role in imposing constraints on women’s basic freedoms to be safe, healthy and live free of fear,” she says. “It’s affected how they control their bodies, move about freely, own property, choose to marry or obtain a divorce, retain custody of their children, have their testimony given equal weight in court, receive an education, or simply work. Brutal injustices have been justified by misinterpreted or selectively edited scriptures, texts and teachings. Another hallmark gained from the task force is 50 percent of workshops and presenters are women-themed and led by women, including “Religious and Spiritual Sources of Inspiration and Empowerment for Women.” Presenters include Mormon feminist blogger and activist Tresa Edmunds, Ilyasah Shabazz, third daughter of Malcolm X and Betty Shabazz, Mallika Chopra, daughter of Deepak Chopra, Dr. Alka Arora, chair of the Women’s Spirituality program at the California Institute of Integral Studies in San Francisco and Ruth Wyler Messinger, president of New York-based American Jewish World Service. Childhood memories are of a father, a medical doctor, who drank heavily and chain smoked. Deepak Chopra was “unpleasant to be around,” she says. “My brother and I liked it better when he was away at work at the hospital and not at home.” That is, until one day, when she was nine-years old, her father, “suffering in a mid-life crisis, walked into the Transcendental Meditation Center in Cambridge, Massachusetts.” In that TM Center, Deepak Chopra learned how to meditate. “For the first time in his life, my father had a sense of peace, connecting to himself and connecting to something bigger,” Mallika Chopra says. “That really began his spiritual journey. So we really grew up in a spiritual context. From the beginning, my dad was quite melodramatic in terms of his experiences. I always feel that TM was an incredible gift given to me — a tool that helped me throughout my life. “I’ve been asked to speak about women’s empowerment,” she says. “The first thing I thought about was my mother. My mother was my greatest source of inspiration. Whenever I found myself at my lowest point, I had to take a step back and look at my mother. I had to look at her not from the perspective of a daughter but to look at her as a woman and as a human being. “People often ask me, ‘What was it like being the daughter of Betty Shabazz and Malcolm X?’ Well, I can tell you there were a lot of expectations. I remember going off to college. People have this perception of my father that was absolutely incorrect. My father was love. My father was peace. My father was integrity. My father was brotherhood. My father was sisterhood. My father served God with his entire being. He traveled the world searching for peace for all of us, asking for not a penny in return for himself or his family. My father was a very young man and most people don’t realize that. “I was raised to be very proud of being part of the African Diaspora,” Shabazz says, “proud to be a woman and proud to be a Muslim. I was raised to understand the importance of education and history, the importance of humanity, leadership and self-reliance — that I am my brother and sister's keeper. Arora offers this audience a series of questions. “What do we do with these (problems) and why do we persist? Why does the Parliament of the World’s Religions draw so many people from all over the world despite these problems? Some of my secular friends would ask that very question. They say, ‘Religion is the opiate of the masses, why bother?’ But there is something within us that keeps us persisting and keeps us bothering with our religious traditions. I would argue that something is that direct experience and connection to something greater than ourselves. Another day before sunrise, Glenn, a Native American, is smudging. A line of people stopped to be cleansed of negativity. Two teepees are nearby. Eyes closed, smell of sage smoke has a pleasing aroma that returns to the senses several days later. Glenn waves burning smudge stick along body front and back. From a pouch, he places a pinch of crushed tobacco in your palm. Prayer is offered seemingly in a climb up at the fire in a circular metal burner. Prayers are offered then the tobacco is tossed into the fire. Inside the Salt Palace, Tibetan monks of the Drepung Loseling Monastery have not arrived yet to continue constructing a sand painting called “mandala.” Sand is actually crushed marble dyed multiple colors. Monks will have laid millions of grains of sand to complete the colorful mandala. Near the mandala is an altar with a portrait of His Holiness the Dali Lama that also includes fruit offerings. At the Parliament’s conclusion on Monday, monks will sweep away the sand, gather sands and pour the grains in a nearby river. “Nothing lasts forever. It shows that,” Geshe Loden, Tibetan Buddhist spiritual leader, told the Deseret News. Nearing seven o’clock, the Rev. France A. Davis and members of Calvary Baptist Church of Salt Lake City are getting ready to hold a worship service in Room 155 C. Three deacons lead praise and prayer. Members of the Inspirational Choir sing. Pastor Davis notes that Calvary formed in 1893, three years before Utah was granted statehood in 1896. Here in Room 251 A, women are in a circle holding hands discussing flow of “Women’s Spiritual Leadership and Empowering A New Generation.” Another of the shared sessions, it is a product of Women of Spirit and Faith which originated at the 2009 Parliament in Melbourne. They are Laura Paskell-Brown, Erin Schendzielos, Anne Fitzgerald, Kay Lindahl, Alison Fast, Kathe Schaaf, Mohini M. Mundy and Karen Boyett. A man comes in the room and joins hands with the women in the circle. The circle breaks. Session begins with the Rev. Guo Cheen, a Buddhist nun, joining the panel. Parliament moderator is Anisha Ismail Patel. About 50 are in attendance, including the one man. “We are not hearing as many voices as men,” Schaaf says about Melbourne. “Women don’t have a way to connect because the parliament is rooted in tradition. There is no voice for women no longer affiliated with institutional religions, those women who have fallen through the cracks. Women of Spirit and Faith are a ministry for women to talk to one another. “For me, there is a lot of warmness and a wealth of beauty in this room,” says Schendzielos, a campus minister in Rapid City, South Dakota. Shaven-head bhikṣhuṇī (nuns) are members of the Dharma Realm Buddhist Association (DRBA), City of 10,000 Buddhas in Ukiah, California near San Francisco. Nuns lead panel discussion titled “Sisters on the Path: Choosing A Life of Simplicity and Compassion.” Nuns touch on personal experiences, how they chose their life, roots of DRBA, community living and community structure. “I’m American-Chinese,” says Bhikṣhuṇī Heng Liang. “I was raised Christian and enjoyed that part of my upbringing. I majored in a computer science program. The future was promising in terms of what I would earn. But I had a sense of hollowness. Material things were not enough. I felt like a tired individual who could do nothing. Kathy Kelly, co-coordinator of Chicago-based Voices for Creative Nonviolence (VCN), talks about poverty in refugee camps in Afghanistan. One of the Afghan Peace Volunteers, Kelly is described as an American peace activist, pacifist, author and founding member of Voices in the Wilderness. VCN campaigns to end U.S. military and economic warfare. Katharine Hayhoe likened being in Hall 4 & 5 for Sunday’s plenary on climate change to her first time speaking in an airplane hangar. Exhibit space is packed with several thousand people. Hayhoe, associate professor of political science at Texas Tech University, is an evangelical climate scientist. Known nationally, she makes the case that climate change — global warming — is being caused by man. Monday morning at the Indigenous Peoples plenary, Ta’kaiya Blaney, 14, sings wonderfully like an accomplished artist accompaniment by guitarist Robby Romero. Blaney is from the Sliammon First Nation (British Columbia). She is also a seasoned speaker, having addressed the United Nations children and youth conference on the environment in Bandung, Indonesia and the Rio+20 UN Conference on the environment in Rio de Janeiro. 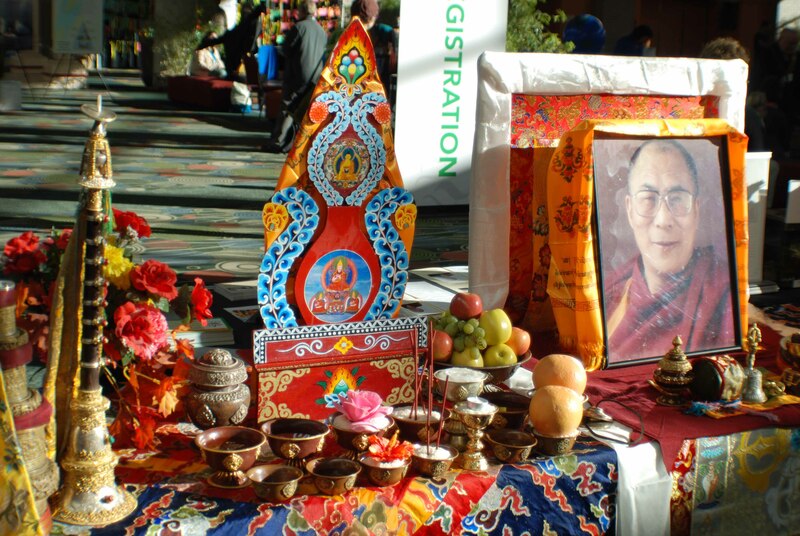 Portrait of His Holiness the Dali Lama is included among offerings on Buddhist altar inside Salt Palace during the 2015 Parliament of the World’s Religions held in Salt Lake City.